Announcing Call of Elespen, the Epic Conclusion to the Keepers of the Wellsprings Series! Exciting news! 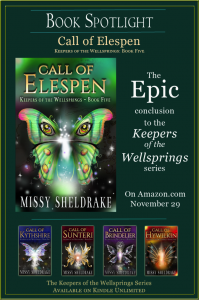 Missy Sheldrake has released Call of Elespen, the fifth and epic conclusion to the Keepers of the Wellsprings series. A vindictive Sorcerer King with a century-old grudge has spent decades gathering an army obsessed with claiming what their master feels he’s owed. Threatened by his dark dealings and sinister followers, will the Champions of Light succeed in claiming Brindelier’s Wellspring for the Dawn, or will its vast power fall forever into the hands of the unforgiving Dusk? Make the choice: Dawn, or Dusk, and ally yourself with dragons, fairies, mages, knights, and muses in the epic conclusion to the Keepers of the Wellsprings series. 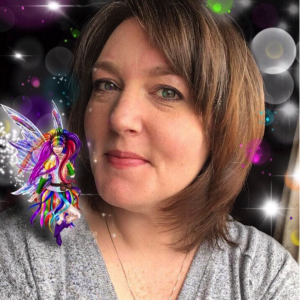 Missy Sheldrake is an author/illustrator who has been conjuring images of fairies in one form or another for as long as she can remember. The wind in the trees and the rich scent of forest earth are her most treasured sources of inspiration, and on most mornings you will find her wandering the wooded paths of her neighborhood, dreaming of the next adventure she hopes to put to the page. She published her first novel, Call of Kythshire, in March of 2015 and intends to keep writing as long as the fairies in her dreams allow it. Galleries of illustrations and excerpts from the Keepers of the Wellsprings series can be viewed on her website and blog. Missy can also be found on Facebook, Twitter, Instagram, Goodreads, and Pinterest. Her books are available on Amazon. Read an excerpt from every book in the series, including Call of Elespen, at missysheldrake.com. This entry was written by A. R. Silverberry, posted on December 7, 2017 at 4:05 pm, filed under Book Release and tagged Call of Elespen, Coming-Of-Age, Epic Fantasy, fantasy fiction, Keepers of the Wellsprings, Missy Sheldrake, Sword and Sorcery. Bookmark the permalink. Follow any comments here with the RSS feed for this post. Post a comment or leave a trackback: Trackback URL.